This microcontroller has nanoWatt Technology, which features six enhanced power-managed "software controlled" modes, power consumption as low as 0.1 microamps in standby mode and a wide operating voltage range from 2- to 5.5-volts which makes this device ideal for battery managed applications. This device also encompasses a new low-current watchdog timer, a 2-speed start-up from a reset or sleep mode and a new fail-safe clock monitor that is used to detect an external clock failure.This powerful 10 MIPS (100 nanosecond instruction execution) yet easy-to-program (only 77 single word instructions) CMOS FLASH-based 10-bit microcontroller packs Microchip's powerful PIC® architecture into an 18-pin package and is upwards compatible with the PIC16C5X, PIC12CXXX, PIC16CXX and PIC17CXX devices and thus providing a seamless migration path of software code to higher levels of hardware integration. 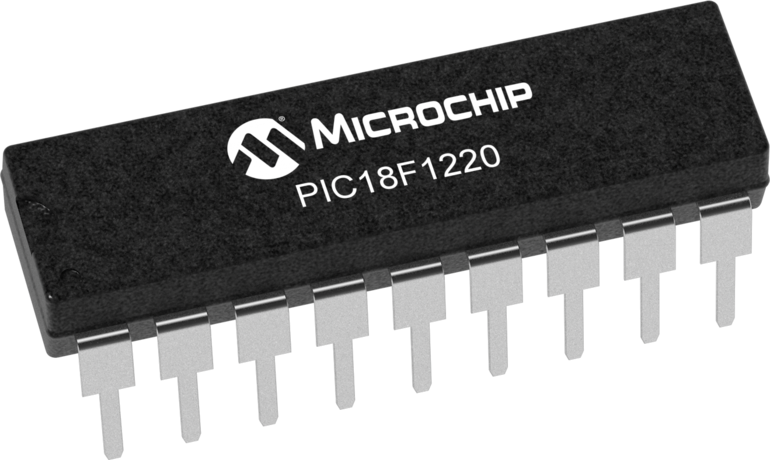 The PIC18F1220 features a 'C" compiler friendly development environment, 128 bytes of EEPROM, Self-programming, an ICD, capture/compare/PWM functions, 7 channels of 10-bit Analog-to-Digital (A/D) converter, Addressable Universal Asynchronous Receiver Transmitter (AUSART) and Advanced Low Power Oscillator controls. All of these features make it ideal for battery powered and power consumption critical applications including instrumentation and monitoring, data acquisition, power conditioning, environmental monitoring, telecom and consumer audio/video applications.